This is a horizontal glass working lathe, bench type, commonly used in precision glass industry for thermometer sealing, electrode sealing, glass to metal seals, graded seals and other blowing and forming operations. 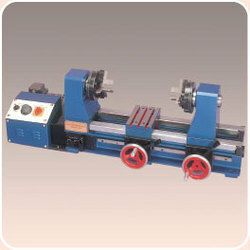 The lathe is carefully designed for accurate and precision operation. The machine can be equipped with ring chucks or rapid action chucks (optional at extra cost). The lathe bed is of special casting, well machined and stress relieved. Burner carriage and tailstock have smooth precision movement on hardened and ground flat guide ways. Spindle drive is by DC motor using roller chains and sprockets. Clockwise and anticlockwise rotation of the spindle is by a selector switch. Spindle rotation can be varied continuously. Tailstock can be declutched by a mechanical clutch. The bed guide ways and the moving parts are protected against heat and dust by a cover. Both headstocks have provision for internal blowing. The machine is supplied complete with motor,controller and a pair of ring chucks. The machine is equipped with an electromagnetic brake for immediate stand still and is blocked for easy opening and closing of the scroll chucks. The brake releases automatically when the machine is started again. Leveraging on our vast experience & established in 1973, we have been able to successfully cater to the demands of the clients by delivering new and innovative products. With our all encompassing range of Fused Quartzware and Silicaware, we have carved a niche for ourselves in the domain. The complete range is manufactured using superior grade raw material, which is procured from renowned vendors of the industry. In addition, we also offer wide range of Water Stills in Glass & Quartz, Water Treatment Plants, Laboratory Glassware, Laboratory Equipments, Laboratory Plasticware and Glass / Quartz Working Machinery, Burners & Tools. Supported by a team of qualified professionals, we have been able to meet the diverse requirements of the clients by offering products designed in accordance with ISO and international quality standards. Further, the large production capacity of our manufacturing unit allows us in executing both large and urgent orders of the clients within stipulated time frame. To attain highest level of client satisfaction, we also offer various facilities like customization of products & packaging, OEM & contractual manufacturing, onsite support and others. Our ethical business practices and flexible approach have helped us in gaining huge client base in export market of Australia/NZ, Indian Subcontinent, East Europe, East Asia, North Europe, Middle East, East/Middle Africa, North Africa, South/West Africa, South America, South/West Europe, South East Asia and North America.